Brad Stanton might not be a household name throughout the City of Delaware, but that doesn’t make his impact on the city and its residents over the past three decades less important. If anything, the fact his name doesn’t ring a bell with most residents means he did his job well. After 32 years with the city’s Public Utilities Department, Stanton retired as director on Wednesday, leaving behind a well-oiled machine that he had more than just a hand in developing. Stanton, however, will tell anyone who listens that his department was never about one individual taking the credit for an achievement or the fall for a hiccup. Instead, it was all about the team, which did its job under the radar. 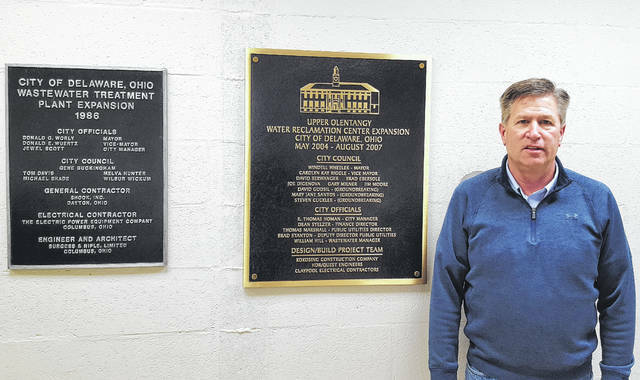 Stanton’s three-decade-plus stint with the city began in 1986 when he was hired as wastewater treatment plant (WWTP) operator. At the time, the city’s population hovered around 20,000. As the city’s population increased over the years to the brink of eclipsing the 40,000 mark, so did Stanton’s role within the public utilities department. In 1998, he was promoted to WWTP superintendent before being named deputy director in 2002. Stanton’s rise to the top of the department reached the pinnacle in 2007 when he was named public utilities director. He said from day one, City Council and administration have always had the residents’ best interests at heart, which made his job easier. When Stanton made the decision in 1986 to leave the Cleveland area for a job in Delaware, he never imagined it would turn into a lengthy career and the place where he would end up raising his three children. Neither did his family. As for his decision to retire from the city, Stanton said with the department scheduled to take on a new project soon, the timing was right to pass the position on to a new director. While he will no longer be employed by the city, Stanton isn’t planning to sit back and relax for too long. “I do plan on getting back to work here in a couple of months for another organization,” he said. Until then, Stanton plans to spend time with his grandchildren, travel, and enjoy America’s pastime. While Stanton has had a hand in his fair share of projects over the past three decades — including the likes of the WWTP expansion project, installation of the 24-inch water transmission main along U.S. Route 23, and the implementation of advanced metering infrastructure (new water meters) — one stands out more than the others. “I’m most proud of the water treatment plant (upgrade and expansion),” he said. “It was a longtime coming, and I couldn’t be more happier with the outcome of that plant in terms of the treatment that it provides and the confidence in the staff who operate the plant on a daily basis. “It was a complicated project, and Brad provided a lot of the expertise and vision in terms of how the water plant would operate,” Homan said.